After patiently awaiting the opening of Busch Gardens’ newest summer attraction, thrill-riders have the chance to be among the first to experience Falcon’s Fury. According to Busch Gardens Public Relations Manager, Travis Claytor, after a soft opening last month, the ride is operating at various times throughout the day, but not 100 percent of the time. “The soft open allows us to fully prepare to host the thousands of people who will eventually be coming through each day. We still do not have a grand opening date, but we hope to soon,” Claytor said. Falcon’s Furry, North America’s tallest free-standing drop tower, began construction in June 2013. The 335-ft. drop tower seats a total of 32 riders at a time, separated into eight rows of four. Park officials said that the ride was scheduled to open this spring, but construction was taking a bit longer than originally expected. “The entire ride experience is around two to two and a half minutes, and the number of people that can ride it hourly varies (on several factors) but will be around 600-700,” Claytor said. Excitement ran high among adventure seekers and, rightly so. After being lifted to the tower’s highest point, which soars 135 ft. above the park’s current tallest coaster Sheikra, riders are tipped at a 90 degree angle and dropped 60 mph downward. Falcon’s Fury is described to be the first of its kind to tilt riders forward at the top before plunging them face-down at 60 mph. 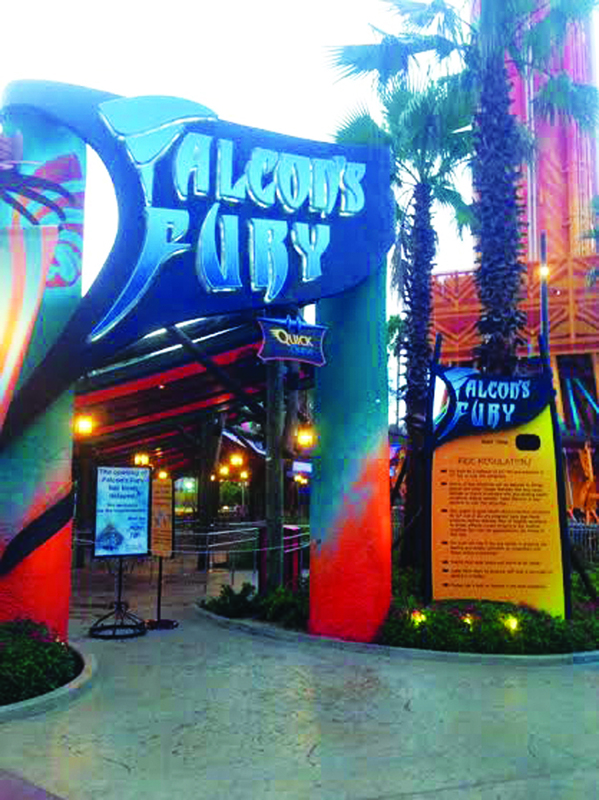 Twelve-year-old River Ridge Middle School student, Grace Ledin has been waiting patiently for a chance to be among the first to experience the thrill of Falcon’s Fury. Not only a new attraction, Falcon’s Fury is also the centerpiece of Pantopia, a newly transformed area formerly known as Timbuktu as well as the newest addition to the park since the opening of the triple launch coaster Cheetah Hunt in 2011. Pantopia itself opened to the public in May with many new restaurants, including Twisted Tails Pretzels that offer a variety of fresh rolled pretzels and breads. Additionally, different shows and shops complete the list of fun-filled activities offered to park guests. For more information about Busch Gardens, visit www.seaworldparks.com.